Bingo is the type of game that has gone around the globe but do you have any ideas of its roots? Well it all started in Italy however the game wasn’t yet the bingo game of nowadays but was a lottery game that migrated to France and then to the US where it was called ‘Beano’ as uncooked beans were used as markers to cover the numbers on the cards. Being one of the mostly played types of bingo game in America, the 75 ball bingo has its origins from the New World itself. While the 90 ball bingo is the mostly played type of bingo game, the 75 ball bingo as well is among the much liked bingo games in both bingo halls and online. Unlike the 90 ball game, the 75 ball bingo is actually played much faster and also has a great number of different patterns. The bingo card played on for the 75 ball game consist of 5×5 grids with most of the time a free grid in the middle meaning that you won’t require covering that grid since it’s a free number. On the 75 ball cards, you will see the letter B-I-N-G-O on top of each of the five columns. The B column contains numbers 1 through to 15, column I has 16 through to 30, column N hold numbers 31 through to 45, column G has numbers 46 through to 60 and column O has numbers 61 through to 75. The aim of the game is quite easy as you will have to cover the required pattern to win the prize that will depend on the number of players that have purchased cards in the game, the more players, the bigger the prize will be. While being in a bingo hall playing 75 ball games, you would be able to have a chat with the person sitting by and online as well through the chat options provided; you will be able to have a chat with the other present players along with the chat host that’s in the room. The patterns that you will generally encounter while having a 75 ball bingo play are lines; horizontal, vertical or diagonal, four corners; where the four corners of the bingo grid need to be covered for you to win and coverall that’s also referred to as full card or blackout; the aim for this one is to cover the whole of the card before a specific amount of numbers are called. Since the 75 ball bingo grid is so straightforward, many patterns are easily developed which are usually to suit the season or mood of the room. 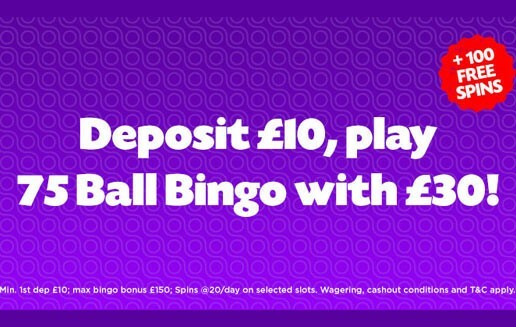 As for the price of the cards, this will vary depending on the bingo hall played in or the online bingo site that the 75 ball game is being played that usually varies from 5p to upwards. The fun time received while playing a 90 bingo game is assured while you play the 75 bingo game since it’s quite an entertaining game.